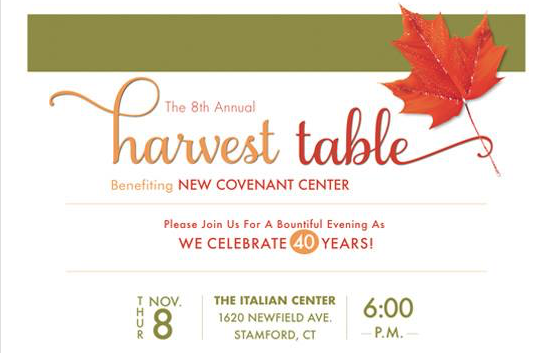 New Covenant Center, which runs one of the largest soup kitchens in the state, will hold its signature fundraiser of the year, “Harvest Table,” from 6 to 9 p.m., Thursday, Nov. 8. at the Italian Center in Stamford. The 8th annual event will feature a cocktail hour, hors d’oeuvres from vendors, a silent auction and a harvest dinner with a presentation about the organization’s 40 years of service. 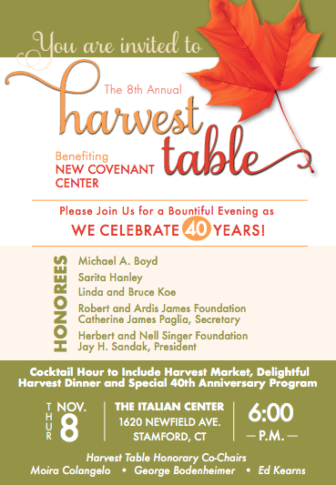 New Covenant Center, now celebrating 40 years of service, provides over 600,000 meals each year to neighbors in need, serving the disadvantaged and hungry in lower Fairfield County, 365 days a year. Nutritious hot meals are provided daily and groceries, meats, vegetables and produce are available in the Food Pantry. NCC also provides guests with life coaching, life skills training, a computer lab, immigration services and basic living needs such as haircuts and showers. The annual event typically draws over 300 attendees from all over Fairfield County. The “Harvest Marketplace” highlights a group of food-related vendors who present demonstrations of their most popular food creations or food-related services to our guests. The marketplace runs for 90 minutes just prior to dinner (6 p.m. to 7:30 p.m). Vendors at display tables offer small samples of select menu items they have brought to share with our guests. They also can discuss their business and answer guests’ questions. You can get tickets here for the event, which takes place at the Italian Center, 1620 Newfield Ave., Stamford. The event’s honorary co-chairs are Moira Colangelo, George Bodenheimer and Ed Kearns. You can register to become a sponsor here.